Although Mark O'brien is now away for a fortnight on paternity leave (congratulations to him and Emma on the birth of their daughter Matilda on Monday morning), work continues apace on the J27. Both sides of the smokebox wrapper have now been secured, the overlap at the top cut and the join welded and ground smooth (see photo). 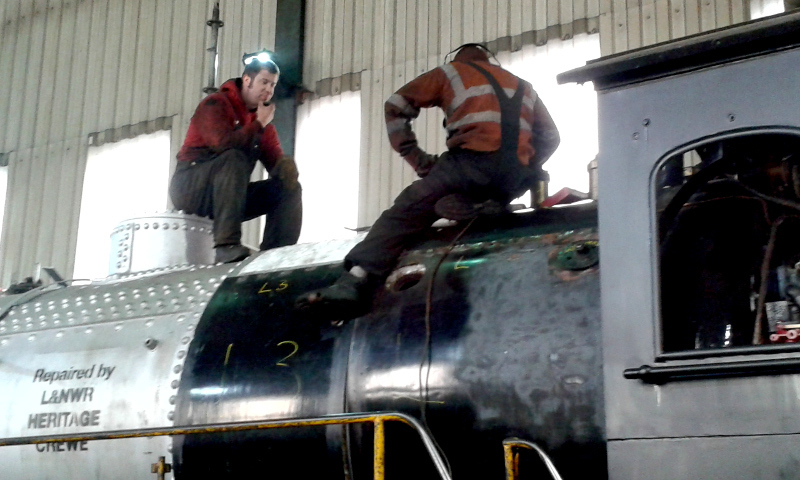 The steam pipe is now being prepared for welding together. The chimney is not now being fitted first as it will not leave enough room in the smokebox to do the work to fit the steam pipe and blast pipe along with any necessary adjustments. The ash pan sprays have now been fitted, and the brake valve reservoir refitted after installing the release trigger. The sliding windows for the cab were delivered by Nigel Hall last Saturday, and John Furness has applied another coat of paint to the cab exterior. He also now has the cab side number transfers. Fitting the cladding is however, proving a problem. It appears that the top longitudinal crinoline running from the cab to the dome, is about half an inch out from centre at the dome end. Whilst it has been possible to fit the first cladding sheet, it has involved a lot of time consuming adjustment and redrilling of new fixing holes and filling of the old ones. 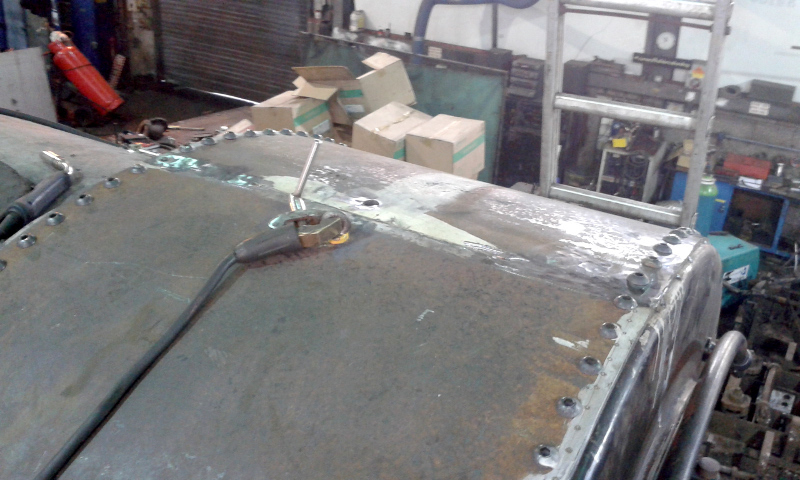 The next sheet cannot be sufficiently adjusted to fit, so it has been decided to cut off the final section of crinoline and weld in a new piece to centre it and allow the cladding to be fitted (see photo of thought being given to the problem!). The tender has now been moved from the running shed to one of the back roads, and is butted up to the S15 tender such that John Furness cannot get in to complete painting the buffer beam. In spite of this extra work, Paul Middleton is still confident the first fire will be lit on 8 April as planned, and the first booked service train will be on 8 May. In anticipation of that, discussions are under way with the NYMR about opportunities for those Hopetown volunteers who want to, to ride out on board while it is running in.